Of the three major European leaders for whom confidence levels were investigated in 2008, Pew data show that German Chancellor Angela Merkel receives the highest praise for having good judgment in foreign affairs. The opposite is the case for Vladimir Putin: During this time of political transition from Russian president to prime minister, Putin’s ratings continue to be low, if not as low as those of U.S. President George Bush. Views of French President Nicolas Sarkozy are more mixed both at home and abroad. 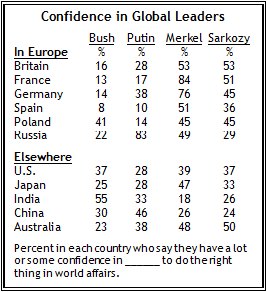 Domestic opinion of these leaders is consistent with foreign opinion in France and Germany but different in Russia. While Germans largely hold positive views of Merkel and the French are conflicted over Sarkozy, Russian confidence in Putin is unequivocal. 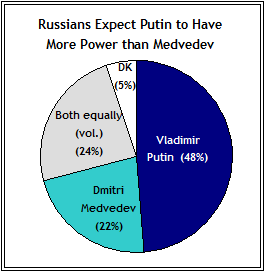 Russian views on how much power Putin will wield are less definitive. Apart from their opinion of the Russian leader, however, one concern is widely shared among Europeans – worry about dependence on Russian energy resources. In Europe and elsewhere, confidence in Putin to do the right thing in world affairs is low. Solid majorities in France (82%), Spain (80%), Poland (78%), Germany (60%), and Great Britain (56%) hold negative opinions of Putin. Views of Putin are equally negative in all countries surveyed in the Middle East. Large majorities in Egypt (74%), Jordan (72%), Turkey (70%), and Lebanon (59%) lack confidence in the Russian leader. 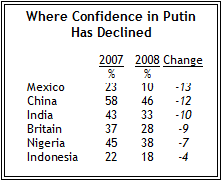 In half of the countries surveyed, views of Putin have remained basically steady between 2007 and 2008. Opinions of Putin have, however, become more negative in a number of countries including Mexico, China, India, and Britain. For China, 2008 marks the first time that Putin’s popularity has declined since being measured by Pew; in 2007 a solid majority (58%) of Chinese held positive views of Putin, while less than half (46%) do now. Despite worldwide skepticism of Putin, he continues to remain popular at home. Just as in 2007, more than eight-in-ten (83%) Russians have faith in Putin’s handling of foreign affairs. Roughly half of Russians (48%) expect Putin to have more power than Dmitri Medvedev – the newly elected president of Russia. Still, a roughly equal percentage say either that Medvedev (22%) will have more power or volunteer that both Putin and Medvedev (24%) will share the political reigns equally. Regardless of who ultimately wields more power, Russians are still inclined to favor “a leader with a strong hand” over a democracy to solve their country’s problems (57% vs. 33%). Russians are slightly less inclined to have faith in a strong leader and slightly more inclined to trust in a democracy in 2008 than in 2007 (In 2007, 63% favored a strong leader compared with 27% who saw democracy as a better problem solver). But support for democracy was much stronger among Russians seventeen years ago in the 1991 Pulse of Europe survey (conducted by the Times Mirror Center – the predecessor of the Pew Research Center for the People and the Press), when 51% preferred democracy and 39% favored a strong leader. Majorities of people in West European countries and pluralities in Poland and Russia have confidence in German Chancellor Angela Merkel to do the right thing in matters of foreign policy. Confidence in Merkel is most pervasive in France, though it is still quite broad-based among her countrymen and women: More than eight-in-ten in France (84%) have faith in Merkel while three-in-four (76%) do in Germany. Fewer, but still about half in Britain (53%) and Spain (51%) hold Merkel in high regard. Positive evaluations also outweigh negative assessments in Russia and Poland, though views are more closely divided in Poland (45% confident vs. 41% not confident). Confidence in Merkel is mixed in non-European nations with the largest economies, and many in these countries are unfamiliar with the German leader. Nearly half (47%) in Japan have positive views of Merkel’s foreign policy leadership while nearly four-in-ten do in the U.S (39%); many in both publics did not provide an answer. Few in either China (26%) or India (18%) trust in Merkel’s judgment although many in both countries offer no opinion (China 40%, India 54%). Merkel is much less popular in the Middle East than in other parts of the world. Majorities in Turkey (68%), Lebanon (60%), Jordan (59%) and Egypt (55%) hold negative views of the German Chancellor. Views of Merkel have fluctuated somewhat in the past year. Positive views of Merkel increased substantially in Spain: In 2007 just over one-third (36%) in Spain had confidence in Merkel while in 2008, half (51%) say they do. A much smaller increase occurred among Russians as well (+5 points). The story is the reverse for both Germany and Britain; fewer among both of these publics are confident in Merkel now than one year ago. In 2007 more than eight-in-ten Germans (85%) and six-in-ten British (62%) had faith in her foreign policy decisions, while just over three-quarters (76%) of Germans and half of those in Great Britain (53%) do now. Among the European publics surveyed, confidence in Sarkozy to do the right thing in matters of foreign policy is mixed. In Britain, a majority hold a positive view of him (53%). The French themselves are conflicted; half (51%) have confidence while the other half (49%) do not. In Poland, positive assessments of Sarkozy (45%) slightly outweigh negative ones (34%). However, majorities or pluralities in Spain (56%), Germany (51%) and Russia (42%) lack faith in the French president. Views of Sarkozy are also largely mixed among non-European publics. A plurality of Americans (37%) have a positive opinion of Sarkozy, though nearly as many in the U.S. hold a negative (30%) view or do not offer an answer (33%). Negative views are especially common in Japan, where half say they have little or no confidence in the French president. Sarkozy receives mostly negative ratings in the Middle East with the exception of Lebanon. More than seven-in-ten in Turkey (74%), and more than six-in-ten in Egypt (67%) and Jordan (63%), lack confidence in Sarkozy in the foreign policy arena. By contrast, a majority in Lebanon (56%) have faith in him. Majorities in all European countries surveyed except Spain say they are concerned about their country’s dependence on Russian energy resources: Roughly six-in-ten or more among British (67%), Polish (66%), German (62%) and French (58%) publics express concern; the Spanish public is evenly split on this issue (46% concerned, 47% not concerned). 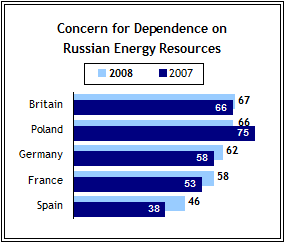 Some limited change in concern about dependence on Russian resources has occurred in the past year; slightly more are worried now in Germany (62%), France (58%), and Spain (46%) than in 2007 (Germany 58%, France 53%, Spain 38%). By contrast, fewer Poles are worried now (66%) than were one year ago (75%). British views have remained unchanged.